OK, I've gotten a closer-to-final answer to my effort to find out how exactly the Metropolitan Transportation Authority's "legal department has advised us that this is a legal transaction," as MTA board member Jeffrey Kay told fellow board members on June 24 regarding a more generous deal with developer Forest City Ratner for the Vanderbilt Yard. No document justifies the deal. Also, though the original 2005 RFP for the Vanderbilt Yard stated that the revised yard should anticipate a 40 percent fleet-wide expansion, the Long Island Rail Road (LIRR) is taking a wait-and-see posture toward what's necessary to support East Side Access (ESA) service to Grand Central Terminal (GCT). Remember, the permanent railyard, instead of having nine tracks with capacity for 76 cars as originally planned, would have seven tracks with capacity for 56 cars. While there would be several improvements, including a western portal--allowing a more direct entrance to the LIRR hub than the current convoluted route--it still would be less capacity than the longstanding iteration of 72 cars. That raises questions of whether a Supplemental Environmental Impact Statement (SEIS) is needed, as several elected officials and others have requested. I filed another FOIL request asking if there was any document that specifically advised or stated "that this is a legal transaction." 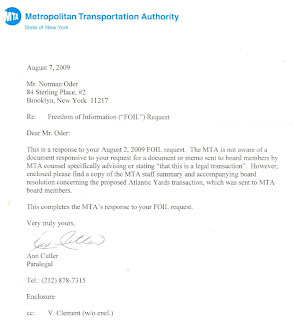 As the MTA's response at right shows, they're not aware of any such document. However, the MTA did enclose a copy of the Staff Summary provided to board members, as well as the Board Resolution on which they voted. Could the general counsel's office have offered verbal advice, as well? Perhaps, but in a transaction this controversial, I suspect they'd want to make sure everything was in writing. As the Staff Summary below indicates, both the (Interim) Executive Director, Helena Williams, and the Legal Department, via General Counsel James B. Henley, indicated their approval of the plan. That does not address, however, whether the 2005 appraisal of the railyard was still legitimate. After all, that appraisal was for $214.5 million cash, with the new railyard included. Instead, Forest City Ratner agreed to pay $100 million, arguing that its new railyard and other improvements were worth far more. In June, the MTA agreed to accept $20 million down, with the rest of the $80 million delivered over 20 years, at an advantageous 6.5 percent interest rate. And it agreed to a smaller, not larger, replacement railyard, worth $100 million less than the developer's original plan. I filed another FOIL to find out what else the MTA board was told before the vote and was provided with the following two-page Q&A document, reproduced and excerpted below. Q. The original design for the improved yard called for nine tracks. The new design requires Forest City Ratner to build a yard with only seven tracks. Is this consistent with the Long Island Rail Road's long-term service plans? A. LIRR and Forest City Ratner ("FCR") have been engaged in a value engineering exercise for more than a year in an effort to identify areas for cost savings in yard design and construction. The agreed-upon design, which will accommodate 56 cars on seven tracks, is consistent with LIRR's plan for shuttle service between Atlantic Terminal and Jamaica after East Side Access service into GCT commences. ESA service is currently scheduled to begin in late 2016. The term sheet requires FCR to commence construction of the yard by June of 2012 and to complete the yard by September of 2016. The shuttle service between Atlantic Terminal and Jamaica will be more frequent than the current scheduled service, but will not require space for as many trains in VD Yard. 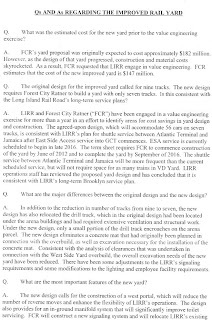 LIRR operations staff has reviewed the proposed yard design and has concluded that it is consistent with LIRR's long-term Brooklyn service plan... The yard will fully accommodate the implementation of the Atlantic Terminal to Jamaica shuttle service. FCR's yard proposal was originally expected to cost approximately $182 million. However, as the design of that yard progressed, construction and material costs skyrocketed. As a result, FCR requested that LIRR engage in value engineering. FCR estimates that the cost of the new improved yard is $147 million. The new yard, with nine tracks for 76 cars, would cost approximately $250 million, MTA officials said in June; thus FCR would save $100 million. 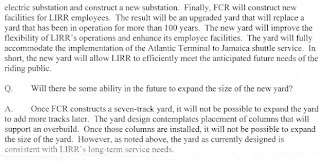 However, the MTA's 2005 RFP for the Vanderbilt Yard noted that the yard "is contemplated to provide additional storage to accommodate the 40% system-wide fleet expansion in 2009 through 2012, which would cause it to be used 24 hours a day." I asked the MTA if the Vanderbilt Yard, in its currently planned configuration, could accommodate the 40% system -wide fleet expansion, whether the size and timing of that expansion has changed (and why), and whether that expansion (or any other factor) would cause the future VD Yard to be used 24 hours a day? MTA spokesman Jeremy Soffin responded: "It is currently anticipated that LIRR service into GCT will begin in December of 2016. The 2010-2014 Capital Program that was recently released publicly requests funding to replace up to 84 of the 170 cars in the LIRR's aging M-3 fleet. The balance will be replaced in the following Capital Program. The M-3 fleet replacement project is proceeding simultaneously with the ESA project, and the new cars (which are called M-9s) will service both Penn Station and GCT. Although in 2005, LIRR anticipated that a 40 percent fleet-wide expansion would be necessary to support East Side Access service, LIRR has since decided to make its final assessment of its ESA fleet needs after it has developed its final ESA service plan. LIRR's fleet needs post-ESA may in fact be less than the 40 percent predicted in 2005." "It was always expected that the VD Yard would operate 24/7 once ESA service into GCT commenced and the service between Brooklyn and Jamaica was changed to a shuttle service," he said. "The number of cars that will ultimately be necessary to support the Brooklyn shuttle service will be determined once a final Brooklyn shuttle plan is developed." In other words, the RFP may just be out of date. Need for a Supplemental EIS? Keep in mind that the impact on East Side Access was not studied by the ESDC. While less apparent than the above-grade elements of the proposed project, the renovated rail yard is an important component of the significant package of public improvements provided by the proposed project. In order to allow at-grade development on the entire project site, the proposed project would include a relocated, improved, and covered rail yard. The new design would streamline train movement between the rail yard and the LIRR Atlantic Terminal and would also add to the rail yard’s capacity. The new rail yard would facilitate the use of LIRR’s new, longer MU electric train fleet. Does that need to be studied in a Supplemental EIS? Reducing the number of tracks undercuts one of the main justifications for AY. This is supposed to be a good location for a super dense condo project with an arena because it lies on top of a transportation hub. If nobody makes significant improvements to the transportation facilities, then an SEIS should address whether this still is an appropriate site for this project.